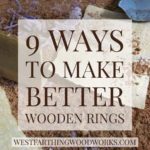 Most woodworkers tend to make similar projects at the same time. It’s rare that someone makes an outdoor table, then a pepper mill, then kitchen cabinets, and a play house. 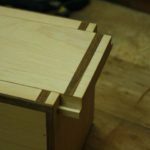 Most of the time, a woodworker that likes smaller projects will make smaller projects. The same goes for woodworkers that make outdoor stuff, or that make furniture. The individual pieces will change over time, but the style tends to be the same. 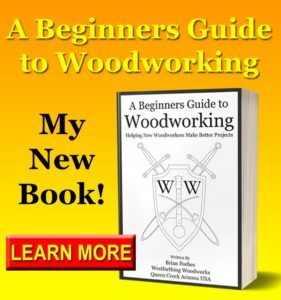 This is great for learning about wood finishing. The type of finish that you use depends on what you are making. There are more ways to finish than ways mentioned here, but these are a great start. 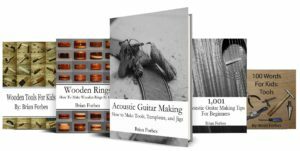 As you learn more about finishing, feel free to try new types. The first thing to look at is what the project will do during its life. Will it be indoors? Outdoors? Will it be used heavily, or left on a shelf? Does it need to be waterproof, or does it not matter? The answers to these questions are going to help point you in the right direction. 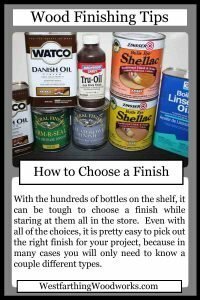 You can also gather information on the piece you are making, and do a quick Google search to see what finish is commonly used. This is a great way to get your initial idea, which you can work into your project as it unfolds. 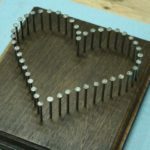 I have been making small to medium projects my entire life. Everything from long stem pipes, to acoustic and electric guitars, pens, toys, wooden rings, and hundreds more random single projects. My common theme is smaller, fun items, that bring joy to the user. The great thing about smaller projects is that you can typically use an oil finish or a wipe on finish. Products like Tru-Oil (full tutorial on Tru-Oil here) and Danish Oil (Tutorial here) are a great place to start. They apply easy, and you can pick the process up really quickly. Though most smaller projects are finished by hand, you can also use sprays like lacquer. If you spray, it can reduce the time it takes to apply the finish. 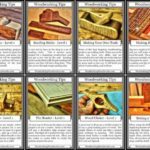 The skills are different than hand applying a finish, but you can always learn both. The one drawback to oil finishes for larger pieces is that they take a long time to apply. A huge piece of furniture will take forever to finish with Tru-Oil. Thankfully, there are ways to finish these pieces that are still easy to use. One of my favorites for larger pieces is a wiping varnish. This is essentially a varnish with a lot of thinner in the mixture. The thinner makes the product stay wet longer. While this sounds like a bad thing, it’s actually meant for the varnish to have time to flatten and smooth out before it dries. It also lets you apply it with a rag by hand. Another product that you can use is furniture lacquer. 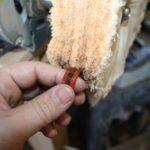 Don’t waste your time with the really cheap clear coats that you find in a hardware store. These are not as good as lacquer, and can leave a bad looking surface behind. Instead, look for a brand like Deft, Mohawk, or Watco. These are more expensive than the bottom shelf lacquers, but you will immediately feel the difference. The finish will look nicer, coat better, and last longer too. When you finish something for the great outdoors, you have to consider your climate when deciding on a finish. In colder areas the finish is going to need to have different properties than in warmer areas. I live in the desert, so the sun is the number one enemy to deal with. Most outdoor finishes have a UV blocker in the mixture. This is only so good, and in an extremely sunny place, it can be next to useless. In Arizona for example, most of these kinds of finishes have to be reapplied every year or two. However, they are still far better than the alternatives. In a very cold place, or a place that gets a lot of rain, look at the Thompson’s Water Seal or their deck treatments. If the product can hold up on an outdoor deck, then it’s probably fine for your project as well. One of the most important considerations when selecting a finish is the end user. If the final user is an adult, with no allergies, then you can use typically anything you like. If the user is a child, then you have to think about what kids do. Kids eat everything. I know, my tiny boss is getting close to three and he still puts things in his mouth that surprise me. When you are making toys for kids, you need to account for the fact that the finish may be ingested. There are several products available that look great and are non-toxic. In reality, most finishes are non-toxic when cured, but it never hurts to start with something that’s non-toxic as well. Look for plant based products like raw linseed oil, or mineral oil. Check for allergies first, and always be on the safe side when creating something for a kid.